For other uses, see Nafanua (disambiguation). Nafanua was an historical ali'i (chief/queen) and toa (warrior) of Samoa from the Sā Tonumaipe'ā clan, who took four pāpā titles, the leading ali'i titles of Samoa. After her death she became a goddess in Polynesian religion. There are historical and mythological traditions about Nafanua; and according to Samoan mythology, she was the daughter of Saveasi'uleo, also considered a god, the Ali'i of Pulotu , which was both a historical place, and a place of the afterlife for the warriors of Samoa, like Valhalla. In one tradition, Nafanua's mother was Tilafaiga the sister of Taema, the legendary conjoined twins. Nafanua is a titled woman known throughout Samoa as a Toa/ Toa Tama'ita'i or Warrior Princess. She was bestowed the title because she avenged her uncle as well as bringing peace to Savai'i through winning the wars. Her village was located on the western side of the island of Savai’i. During Nafanua’s time, there was a war between the eastern and western sides of Savai’i as each side was competing for the land and title of the entire island. In the Samoan culture or any culture for that matter, land is very important because there are more people than allotted land. A family is more prestigious if they own a lot of land; and the family members (especially males) receive greater titles and a bigger share of the land. During this war, if High Chief Lilomaiava caught anyone from the east side on the west side, he would force the person to climb a coconut tree up-side-down, with head down as a punishment. He did this to show his power to the whole island that he planned to conquer. One of the villagers that high chief Lilomaiava caught was Ta'i'i (the uncle of Nafanua), and the older brother of Saveasi’uleo. Ta’i'i was punished and was forced to climb the coconut tree feet first. As he was climbing the coconut tree, he let out a huge sigh because the climb was difficult. Ta'i'i's sighs were overheard by Saveasi'uleo and Nafanua. This made Savesi’uleo angry; consequently he told Nafanua to prepare for war and to cut down the Toa tree. The wood from the tree was to be used to make weapons to drive away the High Chief Lilomaiava and his army. Immediately Nafanua cut down the Toa tree and left it there to dry. A few days later, she went back to the area where the Toa tree was cut and discovered that the tree attracted lots of Pule (seashells). "E gase toa ae ola pule". Literally this means that the shells are living but the Toa tree is dead. But metaphorically speaking, although we have great strength and power as human beings, we do not succeed if we do not have wisdom to make a good, solid decision. It takes courage to make wise decisions. Before leaving for battle Saveasi'uleo ordered Nafanua, "A pa'ia le pa i Fu'alaga, a'e le tuli au'a le Ali'i o Aiga". This translates to Nafanua being ordered to STOP the killing when she reaches the village of Fualaga. It wasn't until the wind blew strong enough to lift her tiputa(coverings) that her dad's order came to mind. She dropped to her knees and sighed a breathe of relief, up until this time the men did not know she was a woman. They felt humiliated because there was only one woman among several men fighting the war. There are a few different interpretations of some of the events, but Nafanua is widely accepted in Polynesia as one of the greatest warriors. In Samoa, the village of Falealupo on the island of Savai'i is the home of Nafanua. Often chiefs from distant villages and islands would come to Falealupo to seek Nafanua's blessings before beginning any military adventure. In 1989, the Chiefs and Orators of Falealupo bestowed the title of Nafanua on ethnobotanist Paul Alan Cox for his conservation efforts in protecting the Samoan rainforest. The title was formally registered with the Samoan Lands and Title Court. It was in Falealupo that Malietoa Fitisemanu searched out for Nafanua. After years of war, Malietoa Fitisemanu wanted to unite Samoa once and for all to end the bloodshed. After many days, Nafanua prophesied onto Malietoa Fitisemanu, "Fa'atali i lagi se ao o lou malo". The literal translation is "Wait on the heavens for a crown for your kingdom". In 1830, the missionary John Williams arrived on the shores (matani'u feagaimaleata) of Sapapali'i and brought the bible from his boat into the hands of Malietoa Vainu'upo, the son of Malietoa Fitisemanu. Thus, Malietoa Vainu'upo became known as "The King whom Samoa listens to". King Malietoa became one of the kings of Samoa and he was instrumental in uniting all of Samoa. Nafanua, is the name of a Pacific Forum patrol vessel operated by the Western Samoa Police Department. It was provided to Western Samoa by the Australian Government as part of the Pacific Patrol Boat Program. Nafanua, the name of the Congrational Christian Church of Samoa - Avondale, Auckland, New Zealand. 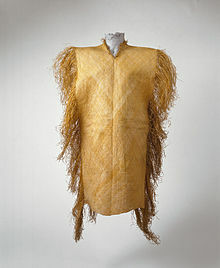 ^ Tuimalealiifano, Morgan (2006). O Tama a ʻāiga: The Politics of Succession to Sāmoa's Paramount Titles. Suva: University of the South Pacific.